Traditional network-centric service assurance solutions cannot provide Communications Service Providers (CSPs) with insight into customer behavior or the impact of network performance on specific customers. As a result, their call centers can get overloaded as they attempt to resolve customer issues and meet service level agreements (SLAs) using historical data and reactive processes. Vitria Operational Intelligence (OI) gives CSPs visibility into real-time customer data and real-time network data, together. It helps them predict and proactively identify, prioritize and resolve service quality alerts and issues, often before they impact the customer. By using real-time customer data and real-time network data, Vitria OI can not only provide real-time problem diagnosis and root cause analysis to accurately locate the cause of service degradation issues but it can also pinpoint individual customers that are impacted by a specific issue. The result is a common operating picture that enables faster detection, analysis and response to service quality and delivery issues. Vitria OI can correlate network and cell site performance issues with call failure rates to provide network operations teams with real-time insight that ranges from an aggregate view of network performance down to the specifics of an individual subscriber’s experience. It eliminates previous problems wherein customers knew about the problem before the network operator did. 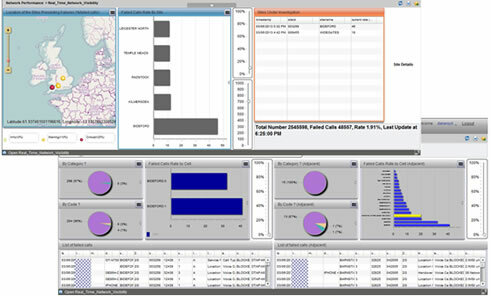 With Vitria OI, operations teams can access live, real-time dashboards that visualize performance and highlight problem hotspots across networks. They can set up watch points to monitor the worst performing cell sites. When a cell tower starts to go down, it typically has a knock-on effect on the surrounding sites as they begin to cover for the one that is going down. Vitria OI can not only detect and help drill-down in to the cause of the original problem, but it can also automatically monitor adjacent cells for problems and raise alerts within an operator’s network management system when jeopardy thresholds are exceeded. Service providers can then take preemptive and automated action to deal with faults and potential customer issues, before incurring costs from customer support calls and escalations. Increasingly, CSPs are looking to capitalize on the additional benefits of speed and performance from 4G LTE rollouts. Having the ability to determine when and where the network is most congested, from what types of traffic or Over-the-Top (OTT) application use, and who that impacts, in real-time, is critical. Vitria OI can help correlate network, cell site, device, usage and customer profile data in real-time, putting CSPs in a better position to proactively identify, prioritize and act on quality of service issues that might impact customers. CSPs like the Multiple Systems Operators (MSOs) can also benefit from being able to monitor their broadband network data in real-time so as to quickly identify points of congestion and optimize their networks for better capacity management. Vitria OI provides CSPs with a way to tap in to live streams of data from a wide variety of sources and then correlate, analyze and derive insight that can be immediately acted upon. It helps CSPs gain better situational awareness around their network operations, improve their customers’ experience, engage in more personalized 1:1 marketing, and detect and prevent fraud – in real time. Once deployed, Vitria OI’s unified streaming analytics and action platform provides CSPs with continuous, real-time operational intelligence that benefits a wide variety of initiatives including those related to marketing, monetization, network, customer care and security programs. Read how Vitria OI can help CSPs improve customer experience in real-time.